After a disastrous start to his campaign in Singapore, NEPEAN is picking up momentum in a big way. 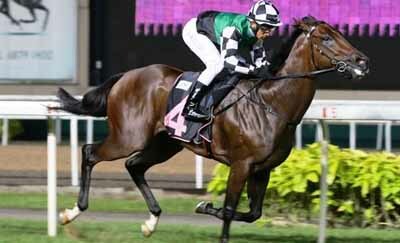 A win over 1400m in Class 4 last month was followed up by an easy victory in the Class 3 - 1600m handicap at Kranji here tonight, the second evening meeting held on a Tuesday night since the first last January. Ridden by Matthew Kellady, the Australian gelding made all the running to win by 1 3/4 lengths. "This horse was stepping up in class (from Class 4 Premier to Class 3), but he showed good form in Sydney, and I was quite confident he could measure up. He is on his way towards the Derby," said trainer Shane Baertschiger. NEPEAN did not race at two but started five times at three in Australia for a win at Randwick and a third at Canterbury in Sydney. The four-year-old finished dead last of 12 runners last January but improved quickly with a third and a second in his next two outings before landing back-to-back double.